Covers the Carson River between Hangman's Bridge on Hwy 89 and Ruhenstroth Dam near Gardner, NV. Topographic relief showing features surrounding the river. 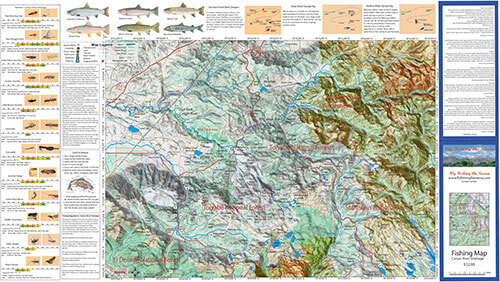 Shows camping areas, GPS Long./Lat., road access, trails, and property boundaries. 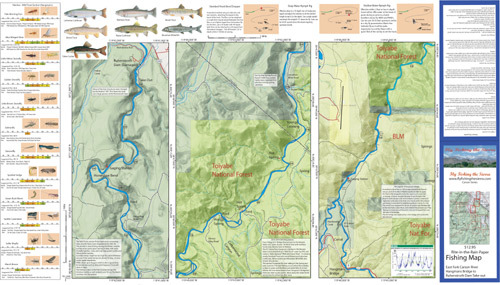 Special Features are the Hatch Chart, Fishing Season and Regulations, Fish Identification, Historic Flow Chart, Nymphing Rigs, and Stream Etiquette guidelines. Printed on Rite-in-the-Rain Paper that will allow you to write those special notes. Waterproof and Durable. 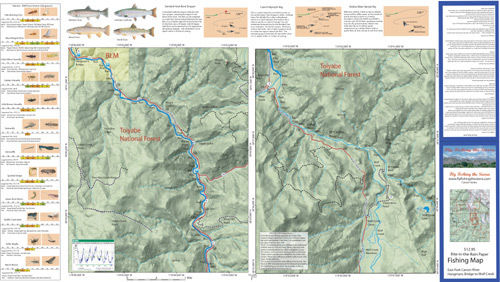 Covers Wolf Creek between the confluence of EF Carson to Elder Creek.Shows road access, GPS Long./Lat.and trails. 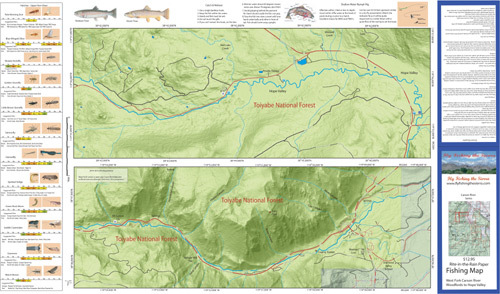 Special Features are the Hatch Chart, Fishing Season and Regulations, Fish Identification, Catch & Release Procedures, Nymphing Rigs, and Stream Etiquette guidelines. Printed on Rite-in-the-Rain Paper that will allow you to write those special notes. Waterproof and Durable. Covers Silver King Creek from confluence of EF Carson to just beyond the Llewellyn Falls. 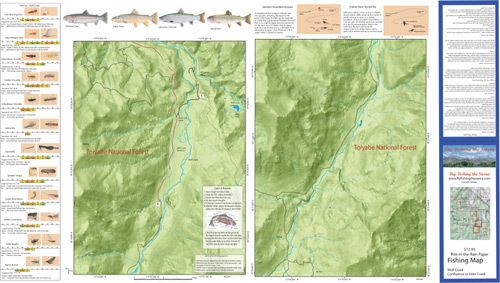 Shows special boundaries set for the Paiute Cutthroat Restoration program, GPS Long./Lat.and trails. 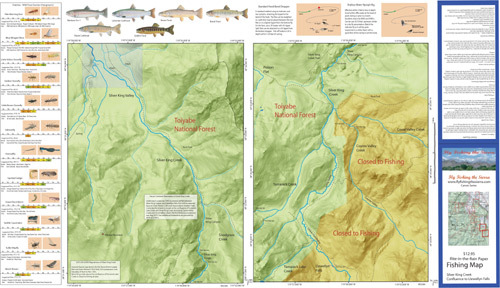 Special Features are the Hatch Chart, Fishing Season and Regulations, Fish Identification, Nymphing Rigs, and Stream Etiquette guidelines. Printed on Rite-in-the-Rain Paper that will allow you to write those special notes. Waterproof and Durable.